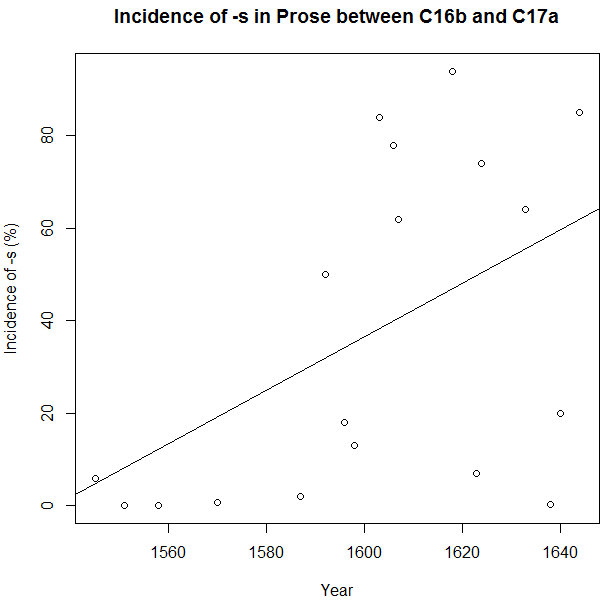 The fact seems to be that by the 1590's the -s-form was fully acceptable in literary prose usage, and the varying frequency of the occurrence of the new form was thereafter a matter of the individual writer's whim or habit rather than of deliberate selection. ・ Bambas, Rudolph C. "Verb Forms in -s and -th in Early Modern English Prose". Journal of English and Germanic Philology 46 (1947): 183--87. ・ Jespersen, Otto. A Modern English Grammar on Historical Principles. Part VI. Copenhagen: Ejnar Munksgaard, 1942. ・ Wyld, Henry Cecil. A History of Modern Colloquial English. 2nd ed. London: Fisher Unwin, 1921.